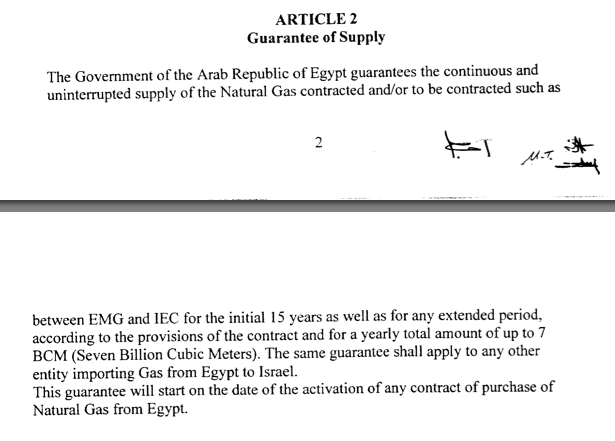 The Egypt-Israel treaty and the gas deal, cont. Here is the full copy of the MoU in PDF, which is also available on the Israeli Ministry of Foreign Affairs' website. It's signed by then Egyptian Minister of Petroleum Sameh Fahmy and then Israeli Minister of National Instructure (and Mubarak's best friend in Israel) Benyamin Ben Eliezer. I am not sure what relation it bears to the Egypt-Israel peace treaty, which it recalls in its preamble, as it does not seem to be an addendum to the treaty. The other aspect is what it means for Egypt. I'm not sure how often countries guarantee delivery of gas to private companies that deliver it to other countries. While technically public, this is a document that was signed by its government in quasi-secrecy, certainly with no parliamentary scrutiny, and nary a word about it in the media. It will no doubt, considering the allegations of high-level corruption in the EMG case, revive the entire concept of odious agreements (like odious debt). Which will make some nervous when we are talking about a MoU that is directly linked to the peace treaty. Beyond the corruption elements in EMG (specifically those involving Hussein Salem) one argument might be made for renegotiation of the deal, which could be conceived under Article 8 of the treaty, commercial obligations to EMG notwithstanding. And continued supply of Egyptian natural gas to Israel, which after all is the country's closest export market. But that depends a lot on the political climate, and whether Egypt is willing to forego the gas exports (there might be good reasons to do so, such as domestic shortages). The other issue is the roll-on impact on other bilateral agreements, such as the QIZ deal, which generates tremendous export opportunities to the US for the textile industry. There are also some interesting comments by Nimrod Novik, an Israeli executive intimately involved with the EMG deal, in the last post on this issue, which shed light on some other questions from the Israeli perspective. Update: More litigation on the way, according to Beltone. Israel's Electric Corporation (IEC) said it will pursue international arbitration against the Egyptian government in order to be compensated for the damage caused by terminating its gas contract with Israel, Al Ahram reported. IEC issued an official statement on Monday mentioning that it will be taking legal action against Egyptian General Petroleum Corporation (EGPC) and the Egyptian Natural Gas Holding Company (EGAS) for the violation of its gas supply and purchase agreement. Despite this, IEC indicated that its output would not be affected by the gas stoppage, as it uses fossil fuels to compensate for the loss. Egyptian natural supply has been repeatedly interrupted since February 2011, as unknown saboteurs bombed the pipelines in Sinai 14 times. "The company is using liquid fuels, which cost substantially more than Egyptian gas," the statement added. Israel depends on cheaper Egyptian gas for some 40% of its energy requirements.